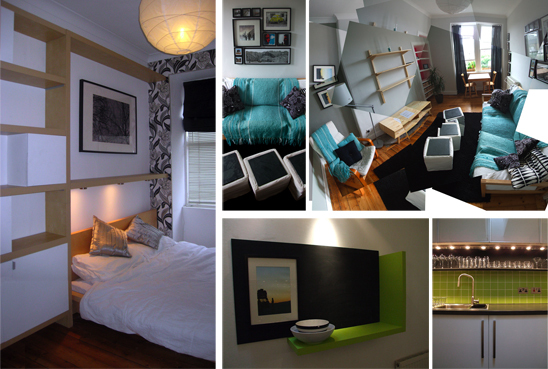 20/8 Howden Street is a small one bedroom, grade 2 listed Victorian tenement flat in the old town of Edinburgh. It's neglect over a number of years resulted in the need for its total renovation in order to provide new life into the tired dwelling. A simple base palette of black, white and grey, with stripped timber floors and timber furniture was used to make the rooms light and airy, vital in such small spaces. Bright splashes if colour were introduced into each room, with the use of soft furnishings in the bedroom and living room, and the lime green splashback to the kitchen. In such a small space, storage is vital, and a number of innovative storage solutions were implemented in the design: a storage wall was designed to become part of the bed head; kitchen, wardrobe and hall storage was maximised; and a recess above the WC cistern became a custom made toilet roll dispenser!